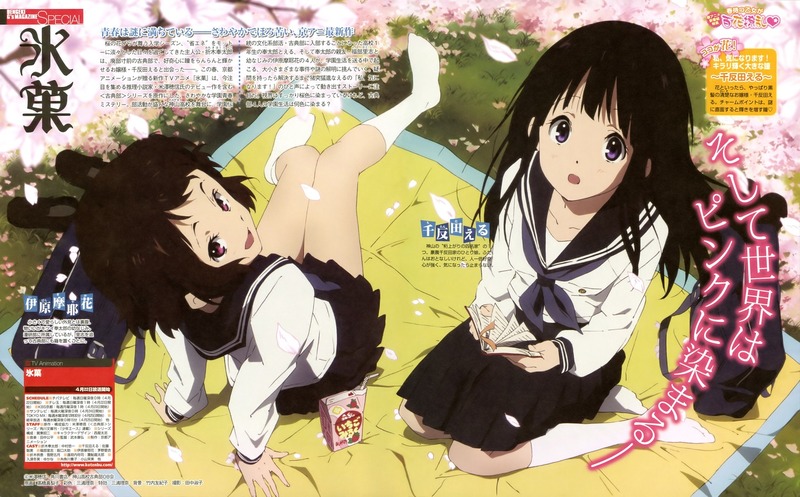 Produced by the legendary Kyoto Animation, heavy-weight 2012 July title Hyouka received mixed reviews despite its great voice acting and magnificent artwork. Some have raised doubts on the story, which revolves around trivial, not-terribly-abnormal events in life, but are presented with an unreserved air of mystery/detective dramas. For this apparent reason, Hyouka is actually tagged on a popular video website (I won’t tell which : ) with “Real • Approaching Science”, which is a parody reference to an infamous Chinese TV program “solving” seemingly super-natural occurrences, only to end up with annoyingly mundane explanations that runs the risk of insulting the IQ of whoever is watching. The storyline of a few episodes of Hyouka, I have to admit, does have similar effects (especially the “mystery” of the math class in ep6, quite baffling really). However, that is not to say Hyouka has nothing to offer. As a matter of fact, Hyouka is something I would like to recommend to not just anime fans, but everybody. Aside from the superb animation (automatic quality stamp for Kyoto Animation), the story by novelist Yonezawa Honobu is a relaxing, yet thought-inspiring piece with a lingering after taste. Not a life-changing title, but a great casual watch. To fully enjoy and understand the beauty of Hyouka, it is not advisable to have a set genre bias in mind. Most mentions of the title, including the Japanese Wikipedia on the original novel+anime, throws it into the detective genre. On Kyoto Animation’s official website, however, the one-liner summary for Hyouka is miles away from the detective/mystery genre:　”Youth is neither tenderness, nor pain, alone. A bittersweet drama of youth.” （青春は、やさしくだけじゃない。痛い、だけでもない。ほろ苦い青春群像劇。） After reading about the original novel, simply titled the Kodenbu series (“Classical Literature Club series”) with Hyouka being one part of it shows that Kyoani’s one-liner contains more truth. Indeed, as a novelist focused on (and supposedly invented) the so called “everyday life mystery” (日常の謎） style, Yonezawa often build the arcs around a certain detective intrigue. The main plot itself, however, still revolves around the everyday normal (like, literally, normal) high school life of Oreki Houtaro’s crowd and never ventured into the territory of a genuine crime/mystery. The mystery-solving (rather than “detective”) arcs in Hyouka are well thought-out, and surprisingly logic-driven and full of details. Despite the lack of cliché elements like hidden corpses, thrown-away pistol, misleading footprints or whatever fanciful murdering contraptions, I believe that any fan of the detective genre would be able to enjoy the deductive reasoning (nod nod to Sherlock Homes : ) presented in Hyouka. Bottom line, the stories observe the rules of the average detective genre well, such that all critical evidence/leads are presented to the viewers under broad daylight fair and square, and there are no inconsistencies/mystery left hanging by the conclusion of each story. Ed2 background with hundreds of well-known detective stories flashing by, source of inspiration for author Yonezawa? Put aside the detective intrigues, the main arc of Hyouka is about how main character Houtaro got rid of his apathetic lifestyle (self-termed “energy preservation”), and put his talents in logical reasoning to use by solving not-terribly-important mysteries. The motivation, you ask? Well, Houtaro is mind-controlled by some kind of GEASS belonging to a certain Chitanda Eru, the lovable, somewhat simple-minded classmate of Houtaro (this is meant to be a cheap reference joke, btw). The daughter of a local agricultural zaibatsu (seriously, big time Japanese farmers could get filthy rich simply by producing “Made-in-Japan rice”, which is so very different from imported types, plus all the government subsidies), Eru is from time and time curious about things, I mean VERY curious about things and forces Houtaro to use his brain much more than he likes. The character development mainly happened on Houtaro, whose view towards life changed little by little and developed a feeling for Eru. Talking about Chitanda Eru, Eru’s curious nature often lends her the flag of an “annoyer”, as is often the case for cute-oriented female anime characters. I will be cautious to make the judgement. Besides the fact that Eru’s curiosity is literally driving the story, isn’t the spirit of “wanting to know” what’s driving our daily progress? While someone who asks questions frequently might be regarded as foolish, real fools are rarely curious. On the contrary, real fools usually have answers for practically everything that they cling to with amazing stubbornness. Going to the real world (or going on tangent is the better word), how many of us actually raise a question when confronted with something we don’t understand, or we PERCEIVE we can’t understand. Let’s say the fiscal cliff, sure enough everyone is talking about it and are pretty excited about the issue, yet how many actually go to the length of reading about the core of the issue which is the US currency/debt system and discover the fact that such fiasco is destined to recur over and over again unless fundamental ails of the financial systems are addressed? My guess is very few, not because we don’t care – many stayed away simply considering it too complicated to be understood. Well, while many cases could indeed be daunting (much more complicated than the dodgy history of Kamiyama High’s bunkasai, which was addressed in the first couple of episodes in fast-paced drama), the truths (or the more reasonable hypotheses) are often worth the effort to find out. And I am entirely off topic now. In summary, Hyouka immersed us with its great art, great soundtrack, great story-telling, lovable characters and certain detective surprises under the guise of the otherwise mundane settings. It was no doubt among the most watch-worthy titles released last year: yet another addition to Kyoto Animation’s mile long winning streak.